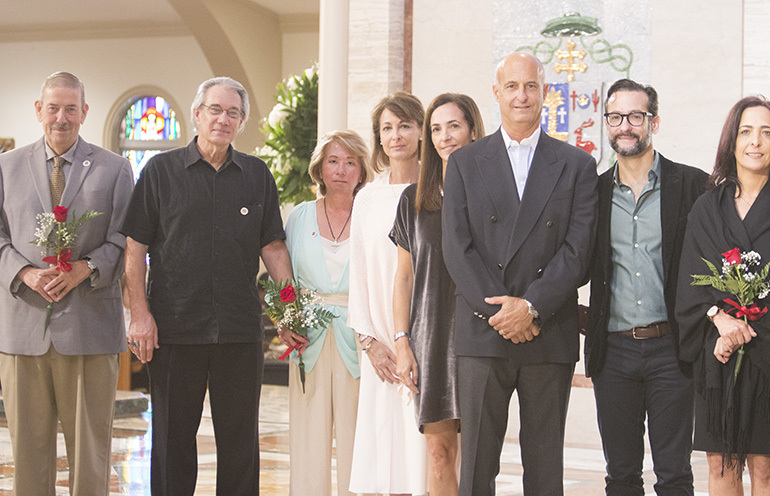 MIAMI | Eduardo and Marcela Eraña thought stewardship meant money. Photographer: ANA RODRIGUEZ-SOTO | FC Those inducted into the Archbishop Coleman Carroll Legacy Society, for remembering the Church in their will, pose for a photo after receiving a rose from Archbishop Thomas Wenski. The rose recalls the words of St. Therese of the Little Flower, who said she wanted to spend her eternity in heaven doing good works on earth. “I thought stewardship was the envelope,” said Marcela. “I had no idea” it also involved time and talent.Then their pastor at St. Agnes Church in Key Biscayne, Father Juan Carlos Paguaga, asked them to head the stewardship council. After educating themselves, they have spent the last year educating others about what it means to give to the church. 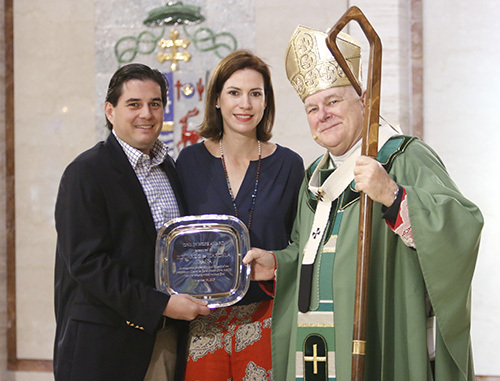 Photographer: ANA RODRIGUEZ-SOTO | FC Eduardo and Marcela Eraña of St. Agnes Church in Key Biscayne receive the 2017 One in Hope award from Archbishop Thomas Wenski. “Latin Americans are not used to giving. They expect the church to give to them,” said Father Paguaga, referring to the ethnicity of most of his parishioners.“It’s a cultural thing,” agreed Marcela. A relative, Anabel Stevens, serves as business manager for the church and school. She encouraged the couple to get involved. “People have to see that you have four kids and you can still help and serve. You can always make time,” she told them. For their efforts, the Erañas were honored with the One in Hope award at this year’s ThanksForGiving Mass, celebrated Nov. 19 at St. Mary Cathedral. The award recognizes a family who “embodies the four infinitives of stewardship”: receiving God’s gifts gratefully, nurturing them responsibly, sharing them justly and sacrificially, and returning them abundantly.“If it wasn’t for our pastor, we wouldn’t have done it,” said Eduardo. Father Paguaga, in turn, credits the Erañas for helping the parish grow “beautifully. There are more people involved, more ministries, and more people aware of the life of the parish,” he said. The Erañas were one of three families honored at the annual Mass, attended this year by more than 600 people. The Mass is a way of thanking everyone who donates to the annual ABCD campaign, which supports the charitable and educational works of the archdiocese. 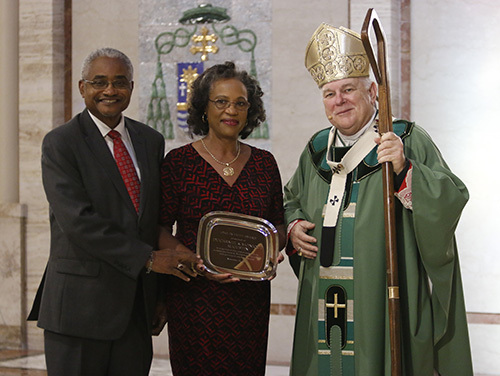 Photographer: ANA RODRIGUEZ-SOTO | FC Ducarmel and Monique Augustin of St. Helen Church in Fort Lauderdale receive the 2017 One in Faith award from Archbishop Thomas Wenski. Archbishop Thomas Wenski celebrated the annual ThanksForGiving Mass Nov. 19, thanking all the donors to ABCD, honoring three families with the One in Faith, One in Hope and One in Charity award and inducting new members into the Archbishop Coleman Carroll Legacy Society.TheThe One in Faith award recognizes “excellence in evangelization” and a “firm commitment” to spreading the faith. Erañas not only head the stewardship committee, they also are involved in Emmaus retreats and the “Why Catholic?” evangelization program. And they’re the parents of four children who attend St. Agnes Academy. The Augustins weren’t exactly sure why they were honored. “Supporting my parish, maybe?” said Ducarmel, a doctor in private practice.But anyone listening to them describe their 30 years of involvement at St. Helen would have figured it out. “Maybe for service,” said Monique, who works as office manager for her husband. “We do a lot of services. We do a lot of medical missions. We help a lot in the church.”In fact, Ducarmel Augustin serves on the board of St. Helen School, where all three of their now adult children attended. He leads medical missions in Haiti. The couple also organize health fairs at the parish. “I’ve been faithful to St. Helen for so long, I know everybody there,” said Ducarmel. Archbishop Thomas Wenski, who celebrated the Mass,thanked all the honorees and all those who donate faithfully each year to the ABCD campaign. “Your gifts opened the door of our world to God and bring hope for our people,” he told them, noting how ABCD helps the Church in South Florida fulfill the biblical commandment to “care for the widow, the orphan, the alien, the oppressed and the poor among us. “And we do this in so many ways,” he said, “through our Catholic Charities, through our religious education programs, our Catholic schools… through our support of our seminarians and priests… in our marriage preparation programs, our lay ministries that form people to minister to the bereaved, the homebound. Yes, we do this in so many countless ways. “But we can do it only because of the generosity of people like yourselves, people who in good times and in bad times keep their support of the Church on their list of major priorities,” the archbishop said.